Sterling Silver Eyeglass Holder Brooch. Useful Elegance In the Shape Of A Book. With a Touch of Class and Style! Entirely Made With Sterling Silver, This Open-Book Brooch is Large Enough to be Noticed and Small Enough to be Tastefully Comfortable. The Pages are Engravable and Were Left Blank for That Purpose. The Pin is Also Made with Sterling Silver and Has a Lockable Safety Clasp. 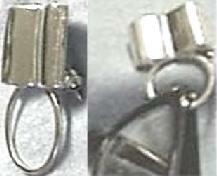 The "Back" Side Shows a Quality of Workmanship That's Typical of Designer's Jewelry. On the Back, Toward the Middle of the Left Side, are Also Found the Signature and the .925/Silver Denomination Mark. A "Sure To Be Appreciated" Gift for Someone Who Wears Glasses! Approx. 38mm High (Top of the Book to Bottom of Loop). Approx. 25mm Wide (Front Page to Page). Cat ~ Bow ~ Hat ~ Golfer and Book. Because Useful Elegance is Always Welcome!